Home » Blog » All Blog Posts » DXY Tangent: Biomimicry! Biomimicry! What an interesting topic -- as is expected when you attend one of DXY's Tangent events! When we think about an elevator, we see levers, gears, cables, and pulleys. When they think about an elevator, they see elephants, and spiders, and birds. The Biomimicry fellows at the University of Akron investigate the world and consider all of the ways nature can inspire new, more sustainable solutions to improve the way products work or how social and economical challenges can be more optimally dealt with. Please join us for the Tangent @DXY to learn more about Biomimicry being researched and implemented right here in Northeast Ohio! Bor-Kai (Bill) Hsiung is a Sherwin-Williams sponsored corporate Biomimicry Fellow at the Biomimicry Research & Innovation Center; a PhD candidate co-advised by Dr. Todd Blackledge and Dr. Matthew Shawkey in the Integrated Bioscience program at The University of Akron. He is also a trained Biomimicry Specialist (2011) by Biomimicry 3.8. Bor-Kai is coming to Biomimicry with interests of studying the material properties of spider silks. He is achieving his goal by doing spider research, with a little twist. Instead of studying spider silks, his research is now focusing on studying nanostructures and color producing mechanisms in spiders, especially for colors that have structural bases (i.e., structural colors). Bor-Kai envisions Biomimicry to be the hope to sustainable and more eco-friendly technologies. You can reach him at borkaihsiung[at]gmail.com. Daphne Fecheyr-Lippens biography includes a lot of bio. While getting her MS in Biotechnology she realized that she didn’t fit in as well as the rest of her classmates. For a long time she was looking for her passion, which she finally found after learning about Biomimicry. Now she realizes that she fits best within an interdisciplinary team, where she can bring a nature-centered perspective to solving problems. She is getting her PhD at The University of Akon, the reason why she left her comfortable habitat of Ghent (Belgium). For her doctoral research, which is sponsored by Parker Hannifin, she is learning from avian eggshells how to create eco-friendly and innovative materials that protect against harmful UV exposure. Together with the other fellows, she co-authors a blog germinature.com about anything related to Biomimicry. Her love for doing good and changing the status quo is also reflected in her startup, JASWIG, LLC, where together with a team of eight they make standing desks for children. By tackling the global occurrence of “the sitting disease” at its core cause, they want to change a societal norm. You can follow her on Twitter (@DaFecheyr) or please e-mail daphne[at]fecheyr.be as she is always interested in connecting with like-minded people. Emily Kennedy is a Biomimicry Fellow in the Integrated Bioscience PhD Program at the University of Akron. Her graduate studies are sponsored by GOJO Industries, the inventor of PURELL® Advanced Instant Hand Sanitizer. Emily spends two days a week embedded in the GOJO R&D department supporting sustainable product and process innovation inspired by nature. For her dissertation, she is generating and testing theory about best practices for biomimetic innovation; with a particular focus on what works in business contexts. Emily believes a procedural template will channel the biomimetic innovation process in a manner that boosts outcome value. Emily has a BA in International Relations (Minor: Environmental Studies) from Colgate University and is a certified Innovation Engineering Black Belt. Emily can be contacted at ebkennedy22[at]gmail.com. The meeting kicked off with Daphne Fecheyr-Lippens (@DaFecheyr) sharing a video by Sustainable Human (@SustainableMan) -- How Wolves Change Rivers -- which is an incredible story about the impact of wolves being reintroduced into Yellowstone National Park. It really makes you think! If the introduction of wolves in 1995 (also see this interesting Wikipedia entry) can have such a HUGE effect on the environment in just 20 years, imagine what changes could be made by modifying human behavior! We recommend you watch this! NOTE: There are "elk" pictured in this video when the narrator is referring to "deer." This is because the narrator is British and the British word for "elk"
refers to elk so we wanted to be accurate with the truth of the story. Daphne Fecheyr-Lippens did a great job of relating the video to the principles of biomimetics. By studying nature, we can learn how to make products that benefit humankind that are more efficient. Next, we examined abalone shells that were passed around the room. Daphne noted that while they are made from the same material as sidewalk chalk, which is brittle and crumbles when struck, the abalone shells are strong enough to potentially deflect a bullet. What makes the abalone shell so impervious to attack? Centuries of evolution of the abalone has created a material where protein and other organic materials are added to calcium carbonate (CaCO3) to make a very strong shell. The challenge is for researchers to use the principles of biomimetics to unlock the secrets of this material, and find real world uses that benefit humans. We also found this YouTube video, Mollusc shells take a beating without shattering, from a New Scientist (@NewScientist) article entitled Battle-hardened oyster may help toughen combat shields, which shows how the nanoscale structure of shells makes the calcite structure strong. The archerfish's ability to shoot water droplets with deadly force is remarkable. An archerfish can bring down insects and other prey up to three meters (9.84 feet) above the water's surface. Emily Kennedy shared this information about the ability of the archerfish, and then challenged the attendees at DXY's Tangent to think about a practical use for the process of creating this powerful stream of fluid. Perhaps, by applying the mechanics that have evolved in this fish over generations, a useful product can be developed that uses less electricity to move fluids -- an energy-efficient dispensing method based on nature! The presentation about biomimicry wrapped up with the attention-grabbing activities of passing around spiders (they were dead and in glass vials), and shining lights on some really cool shoes. Bor-Kai (Bill) Hsiung's (@bkHsiung) biomimicry fellowship is sponsored by Sherwin-Williams (@SherwinWilliams). He is interested in eco-friendly technology for creating color. He shared with us that the color blue used in much of our clothing is manufactured using a process that can generate a lot of pollution and waste. He asks if there is a better way of producing color -- a way that uses systems of nature. If you are arachnophobic, you would not have enjoyed this part of the meeting. Bill provided a tarantula and other spiders in vials, and invited us to use our iPhone lights to illuminate them. Under normal lighting, they were just plain, dead spiders, but with the focused light bouncing directly back, bright colors were seen on the spiders. Here is a video we found that shows the effect. Also, be sure to see the videos that Bill sent Stuart in the blog posts and tweets below. Bill then brought our attention to his normal black shoes, and asked a person behind me to shine his iPhone light directly at the shoes. "Wow, that's amazing," we heard the person say, but all we saw were the black shoes. Then Stuart shined his iPhone light and we watched the shoes glow with iridescent colors. The effect only works when a person is in direct line with the light bouncing back. Here is a video that Bill sent us via twitter after the meeting of the Adidas black Xeno shoe. Believe us, that the Introducing XENO video does not demonstrate the full effect. It is much more impressive in person. To learn more, see some of Bor-Kai (Bill) Hsiung's research papers on ResearchGate website here. GLBio - Innovation through Biomimicry! Wow! We know that "wow" might be an overused word, but it does fit when describing what GLBio (@GLBiomimicry) is achieving in Northeast Ohio. 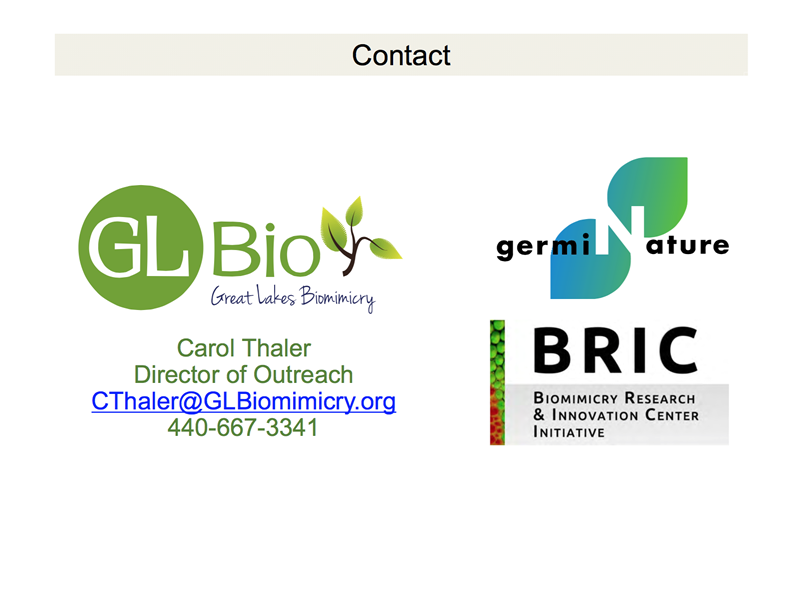 GLBio consists of a collaboration of Northeast Ohio organizations and individuals focused on developing a place-based, living learning ecosystem based on biomimicry. Currently, over 100 individuals from all elements of the NEO community are involved in this collaborative effort ranging from business, educational, medical and public and philanthropic sectors. Collectively these groups are engaged in working to determine what structures and processes are needed to establish Northeast Ohio as the world’s preeminent biomimicry lens capital. Additionally, these groups are exploring means to leverage local assets for economic advantage. We learned from GLBio's director of outreach, Carol Thaler, that they are the only educationally driven economic development biomimicry program in the world. Some similar work is being done in the country of South Africa, and in the Netherlands, but nowhere else in the world is there a program like the one here in our community. Carol announced the names of some of the foundation supporters of GLBio: The Cleveland Foundation (@CleveFoundation), GAR Foundation (@GARFoundation), and Nord Family Foundation. Stuart associates these foundations as leaders in promoting quality educational programs. There are many local Northeast Ohio companies that partner with GLBio. Rather than provide an outdated list -- since we are sure that more will be added in the new academic year -- we invite you to visit the GLBio website for their list of partners and sponsors. 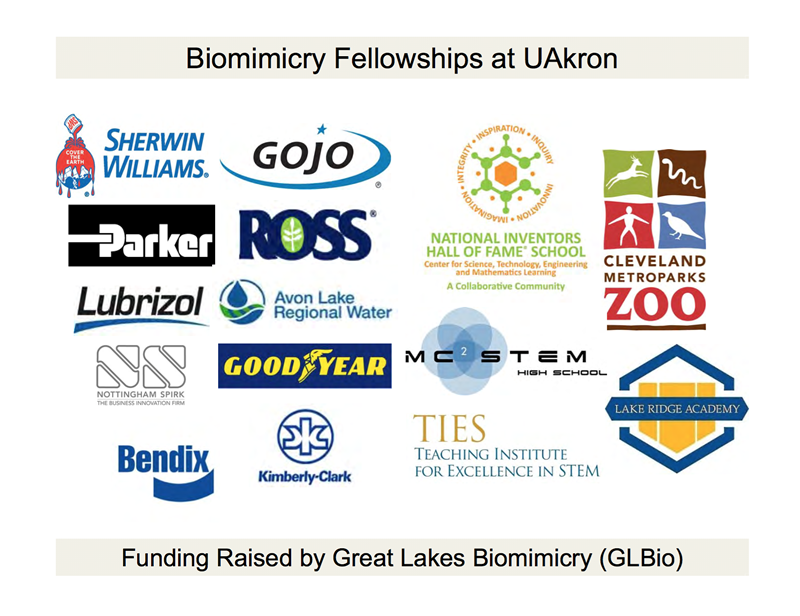 In addition to learning of the work of GLBio (@GLBiomimicry) on their website, be sure to hear directly from the Biomimicry Fellows from the University of Akron (@Uakron) on their Germinature blog. Welcome to Germinature! This blog is co-authored by Biomimicry Fellows being trained in a five year Integrated Bioscience PhD Program at the University of Akron (UA). The Biomimicry Fellowship program launched in August 2012. The purpose of this blog is to share our educational experience and draw readers into the fascinating world of biomimicry. We encourage you to comment regularly, raise questions, and ignite discussions! We also want to thank Chuck Soder (@ChuckSoder), the technology reporter for Crain's Cleveland Business (@CrainsCleveland), for sending Stuart a direct message on Twitter with links to two articles about GLBio (@GLBiomimicry). The first article, from 2013, gives great insight into the early work of GLBio founder Thomas N. Tyrrell to make biomimicry become part of Northeast Ohio's culture. The second article presents some current Northeast Ohio projects that use processes learned from nature. We are very grateful to DXY for organizing this and other Tangent events, so that we can learn about the unique resources in our backyard. There is so much happening in Northeast Ohio! Daniel Nelson (@TheOneDanNelson) emceed the evening, and stated that the purpose of Tangent is to go beyond DXY's creative work to showcase others' innovative endeavors. We have bolded the names of the Tangents we have attended. After reviewing this list, we wish we had seen them all! DXY does medical and for our very first Tangent @DXY we're partnering with DragonID LLC (@drgnid), a Cleveland firm also developing bleeding-edge medical technology. Eugene Malinskiy (@emalinskiy), the CEO and owner of DragonID, LLC, a healthcare innovation and design firm focused on surgical devices, medical software, imaging platforms, and complex statistical analysis, will share his latest project that combines all the awesome things; medtech, big data, Africa, telecom and more! DXY does arts & culture and for our second Tangent @DXY, we're bringing in Jane Alexander (@JaneCAlexander), CTO of The Cleveland Museum of Art (@ClevelandArt). Jane is responsible for technology implementation at the Cleveland Museum of Art. Jane's strategic vision played a key role in creating the innovative Gallery One. The revolutionary space features the largest multi-touch screen in the United States, which displays images of over 3,500 objects from the museum's world-renowned permanent collection. Jane will discuss the technology behind Gallery One and innovative technology on the horizon for one of the greatest art museums in the world. Tangent DXY - Fun with Robotics! Please join us for an awesome Tangent @DXY May 13. This month's Tangent features one of the coolest technology developments of our time ... robots! Dr. Roger Quinn joins us from The Center for Robotics Research at Case Western Reserve University to discuss biologically inspired robotics. In addition to his talk, Dr. Quinn will be bringing in some of his labs’ robots for an in depth look at how biology can inspire robotic design. Learn about design principles of robotics, see cool robots up close and personal and check out different uses of robots here on earth, other planets, and moons! Tangent @DXY - Fun with Exoskeletons! You're invited to the fourth installment of Tangent@DXY! This month's speaker, Skyler Dalley, comes to us from Parker Hannifin (@ParkerHannifin), a global leader in motion and control technologies, based right here in Cleveland! Skyler joined Parker to work on the Indego Device, a powered lower-limb orthosis that enables fully assisted standing, walking, and sitting or individuals with mobility impairment or paralysis, also known as an exoskeleton. As of this year, Parker has obtained clinical trial agreements with five top-ranked rehabilitation institutions in the U.S. and continue to demonstrate the benefits of Indego for use in therapy and at home. DXY does technology & beverages and for our next Tangent @DXY, we're bringing in Justin Carson (@JustinBeertech), Cofounder of Platform Brewery (@PlatformBeers) and owner of JC Beertech. Justin started JC Beertech as a one-man operation 14 years ago. It has grown to service 5,000 customers in five states and employ fifty individuals. In order to expand his passion for good beer, Justin and his partner Paul Benner opened Platform Brewery to the public in July 2014. Unlike any other, Platform offers an incubator program to assist home-brewers transition into the marketplace. Platform is a full production and distribution facility with an on-site tasting room. Please join us for a Tangent @DXY to learn more about some of the coolest technology being developed in Cleveland right now! DXY Tangent | What is Dark Matter? For our next Tangent @DXY, we're bringing in Glenn Starkman (@gstarkman), Professor of physics and astronomy and director of the Center for Education and Research in Cosmology and Astrophysics at Case Western Reserve University (@CWRU). The Topic: We look at galaxies and we see that the gravity of the ordinary matter can't possibly stop them from flying apart. We look at clusters of galaxies and come to the same conclusion. In fact, we need dark matter to make those structures in the first place. Yet the dark matter detectors we have built for the last 30 years have consistently failed to find dark matter, and we've failed to make dark matter at the Large Hadron Collider in Geneva. So what could that dark matter be? And how could we look for it? Please join us for the Tangent @DXY to learn more about the oldest mysteries being researched in Cleveland right now! For our next Tangent @DXY, we're bringing in Anne Trubek, Founder and CEO, Belt Magazine (@Belt_Magazine), Writer-in-Residence, Oberlin College (@OberlinCollege). The Topic How has texting, tweeting, updating, and emailing altered our habits of communication, our spelling conventions, our writing and, most provocatively, the English language? This talk will disabuse your fears over getting digital writing "wrong" while discussing the very real changes the digital age has made to writing and language. Please join us for the Tangent @DXY to learn more about the oldest technics we use every day being researched in Cleveland right now! A BIG thank-you to Dan Young (@DanYoungDXY), CEO of DXY, for making these Tangent events happen. They are a great asset to our community. Here are some of the tweets and retweets that relate to this DXY Tangent event on biomimicry. Please share with others by retweeting items of interest.
.@DaFecheyr thank you for your @dxydoes' #DXYTangent talk about your #biomimicry work with @GLBiomimicry & your doctoral work at @uAkron.
.@DaFecheyr also, here are the @CleGiveCamp blogs that @TheOneDanNelson told U about http://t.co/V6pxQLsETr Thx for your interest in #CleGC!
. @TheOneDanNelson thx for arranging @DaFecheyr & other @uAkron doctoral students to talk about @GLBiomimicry at #DXYTangent. It was great!